Anemia of chronic disease (ACD) is anemia that is found in people with certain long-term (chronic) medical conditions that involve inflammation. Anemia of chronic disease is often mild. You may not notice any symptoms. Anemia may be the first symptom of a serious illness, so finding its cause is very important. Anemia is often mild enough that it does not need treatment. It may get better when the disease that is causing it is treated. The anemia will improve when the disease that is causing it is treated. Discomfort from symptoms is the main complication in most cases. Anemia may lead to a higher risk for death in people with heart failure. Call your provider if you have a long-term (chronic) disorder and you develop symptoms of anemia. Nayak L, Gardner LB, Little JA. Anemia of chronic diseases. In: Hoffman R, Benz EJ, Silberstein LE, eds. 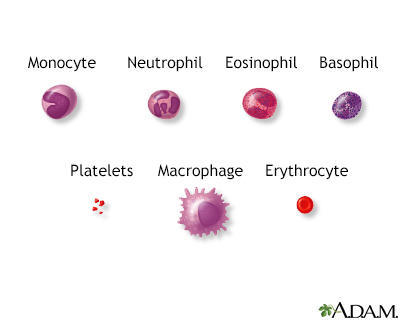 Hematology: Basic Principles and Practice. 7th ed. Philadelphia, PA: Elsevier; 2018:chap 37.